Although Wisconsin became a state on May 29th, 1848, it did not have a state flag until decades later. You might not know that the first version of Wisconsin’s state flag participated in the hardest battles of the Civil War. The ladies of a community often sewed flags for the first regiments leaving the state. Their craftsmanship was beautiful, but there was a lot of variation in design and measurements. 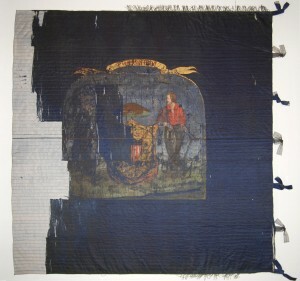 The 2nd Wisconsin Regimental flag was crafted by the ladies of Madison in 1861. The ladies opted to include the Wisconsin Coat of Arms on one side. Lacking any guidance on design, the emblem was copied directly from Governor Randall’s stationery! This might be Wisconsin’s very first state flag, although it was still years away from being official. As the Civil War carried on and more regiments signed up to fight, Wisconsin standardized its flags. An official design was approved in March, 1863. The 2nd Wisconsin was still carrying its set from 1861 and was one of the first units to request new flags. Replacements were sent to them in June of 1863, but the old flags were not quite ready for retirement. They led the 2nd Wisconsin into Gettysburg for one final battle. The ladies of Madison must have gasped when they saw their beautiful silk banner return to the state in shreds. This early example of Wisconsin’s state flag was not created to fly idly on a government building, but rather to serve right alongside its soldiers in the toughest trials of the Civil War. Your regiment will doubtless part with regret with the glorious old flags beneath which it has won so high a reputation, and around which its brave officers and men have so often rallied, and poured out their blood like water in the contest with the enemies of the Union and Constitution; but those flags, returned to this state, will be guarded with care, and serve as mementoes of your valor. The flags formed the foundation of the collection of the Grand Army of the Republic Memorial Hall, established in the Capitol in 1901. They remain a highlight of the Wisconsin Veterans Museum’s collection today. Some flags are so fragile that they have only been unfurled once in the last 150 years for study and documentation. Today, on the anniversary of Wisconsin’s statehood, take a moment to look up and appreciate the blue state flag we often take for granted. You can explore the history of Wisconsin’s Civil War flags at http://bit.ly/ShGak0. Go in depth and search for other treasures related to Wisconsin’s early history at http://bit.ly/1oxMCRZ.